Wal-Mart keeps having what you might call image problems. No one seems to want it to go into the banking business, it was just busted for overcharging customers in Wisconsin, and several states are gunning for the mega-retailer for not providing adequate healthcare for its employees (leaving taxpayers to pick up the difference). Wal-Mart are presently under investigation for mishandling hazardous waste, and it has long had serious problems with sweatshops overseas. It is fighting a class-action lawsuit claiming that it systematically discriminated against female employees, and was exposed for having taken out life insurance policies on its lowest-level employees. But this just beats all. 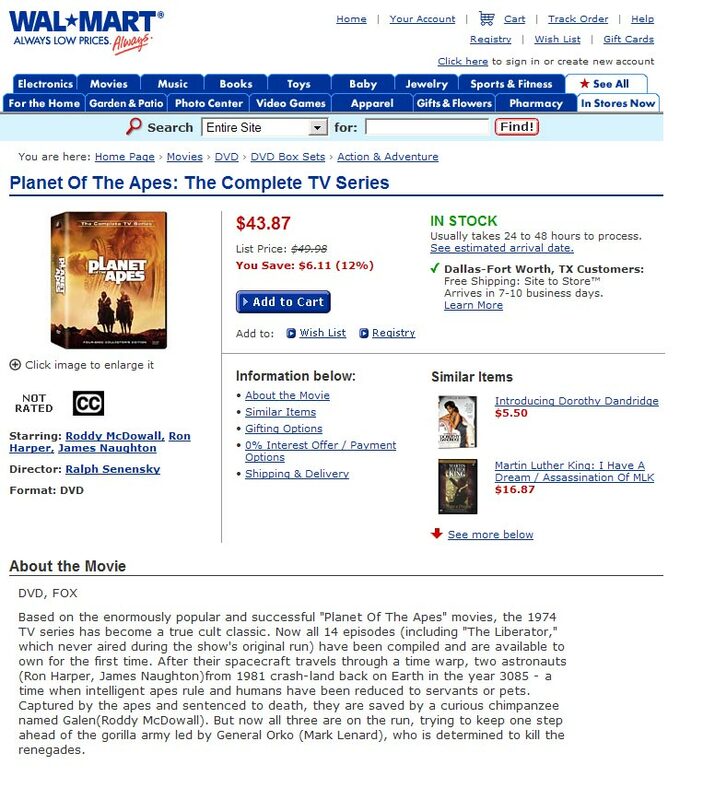 On Wal-Mart's website, the page for the Planet of the Apes DVD set includes recommendations for "similar items." Listed there are films about Dorothy Dandridge and Martin Luther King, Jr., "Unforgiveable Blackness: The Rise and Fall of Jack Johnson," and "What's Love Got To Do With It," a film about Tina Turner. BoingBoing.net has a full screenshot, in case Wal-Mart takes the page down. UPDATE : Wal-Mart has apologized and claimed that it's cross-selling system had gone haywire. They deny that anyone perhaps coded some offensive keywords to enable the system to equate apes and African-Americans.